By utilizing our simple and informative smell removal guide, you will quickly learn how to get rid of cat smell from experts, take immediate action to rid cat odor, and Smell the Difference! As a cat lover, it’s hard to conceive of life without cats and what life was like before. Chances are that you tolerate a lot because of the love and affection your cat gives you in return. You may think that some smell, hair and dander comes with the territory and are a fair trade for having a wonderful, sweet cat. However, others may not be as understanding about tolerating the unpleasant cat smell and it could affect your social life and home value. The great news is that you don’t have to choose between your cat and a smell-free home. There are some very effective solutions to get rid of cat smell. The good news is that potent cat smell can be removed so you don’t have to let it jeopordize your home value and stop you from enjoying it. By utilizing our simple and informative smell removal guide, you will learn how to get rid of cat smell from smell experts, take immediate action to rid smell, and Smell the Difference! Find the areas with the cat smell or with a urine mess by following the ammonia smell or using a black light, saturate it with ODOREZE™ Floor Odor Control Spray, and let it soak in for a few minutes. Blot up any excess moisture with rags or paper towels. Repeat this procedure, as necessary, to break down the really old cat odor that has settled in. Finally, spray down the treated areas with clean water to rinse it and blot up with paper towels or rags. By following this procedure, you will reduce the cat smell and prepare it for the next step. If you intend to clean the entire floor, ODOREZE™ can also be added directly to your regular carpet cleaner or floor detergent and used as usual to get the cat smell out. If you have any items with cat smell or if they have been sprayed with urine, remove and let them air out in the sun as long as possible. Upholstery, cushions, and clothing are very good at absorbing and retaining cat smell. Any fabrics that can be washed should be in hot water. You can also use ODOREZE™ Natural Laundry Deodorizing Additive to get rid of really stubborn cat smells from clothing by soaking them in it prior to washing or adding directly to your laundry detergent. The second step in cat smell removal is to follow the recommendations below to get the smell out using professional strength SMELLEZE™ Smell Removers that rid smell without masking it with harmful fragrances. This is a proven green economical deodorizer that is made in the USA, works 24/7, and is reusable for over a year. It has been used successfully for over 20 years and recommended by thousands of people all over the world. This can be accomplished by sprinkling SMELLEZE™ Eco Urine Deodorizer Granules (only $12.99) on dry wooden, linoleum, tile, or concrete floors. If you have carpeting, use SMELLEZE™ Eco Carpet Deodorizer Powder (only $12.99). Leave on the dry floor for a few hours or overnight (longer the better) to draw the cat smell out of the floor and to eliminate it before it gets released into the air. Then simply vacuum or sweep up and discard. 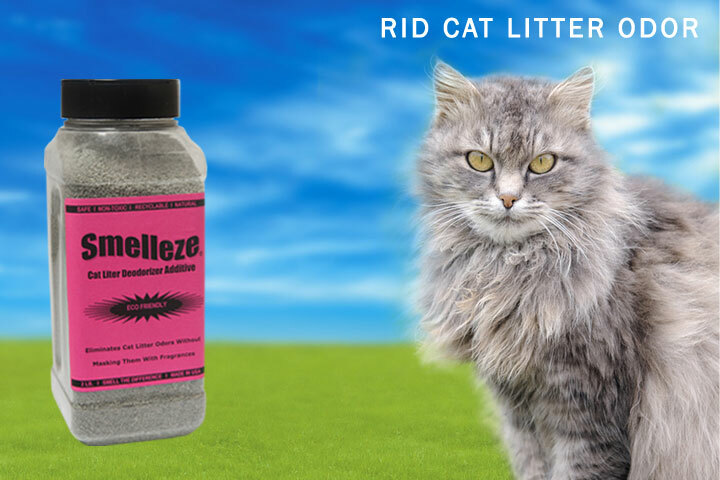 If the cat smell is coming from your yard, simply sprinkle SMELLEZE™ Eco Yard Deodorizer Granules. It’s designed for outdoor use (shrubs, lawn, trees, driveway, ect.) and there is no need to do anything after using. Do this by simply placing the SMELLEZE™ Reusable Pet Deodorizer Pouches (only $12.99) in areas with the cat odor and smell the difference. This smell remover attracts unpleasant cat smell like a powerful magnet, absorbs it like a super absorbent sponge, and eliminates it without masking with harmful fragrances. Using a fan and opening doors and windows will accelerate the cat smell removal process. In addition, you can place or hang SMELLEZE™ smell remover pouches on the cold air return in your home to continuously filter out the cat smell and harmful pollutants as your air recirculates. This is also a good way to prevent smells from building up in the future. SMELLEZE™ pouches are the only reusable smell removers available that last over a year so they are more cost effective than any other deodorizer including most home remedies. As an added benefit, they are eco-friendly, non-toxic, odorless, natural and safe for people, cats, and the planet! Since your cat can bring germs form the outside and have urine accidents that result in the growth of smell causing bacteria, it’s important to kill germs and prevent them to permanently solve cat smell problems. This can simply be done by replacing any light bulbs you have in your home with SANIBULB™ Air Sanitizer & Purifier CFL Bulbs. SANIBULB™ will sanitize your air by killing various microorganisms such as smell causing bacteria in addition to mold, viruses, fungi, and dust mites without the use of any harmful chemical sanitizers. As an added benefit, it will also reduce your energy consumption by 75% and save you money! Once you have completed the hard work of eliminating the cat smell, it’s important to take the following proactive steps to prevent the cat odor problem from resurfacing. It’s advisable to open your windows and doors frequently when the weather is pleasant to let fresh air and sunlight in. Use window fans to improve the ventilation in your home especially in areas that your cat spends the most time in. Air ducts can harbor cat smell, mold, allergens and dust. Have them cleaned out regularly by a professional duct cleaning company to help keep the cat smell from reappearing because moisture and contaminants can seep into air vents to generate smells. Kennel your cat while you are at home or, at a minimum, keep your canine friend on hardwood or linoleum floors. They clean easier and retain less smell. Put down urine absorbent pads around the areas that your cat continues to make mistakes on. A smell can be an early warning sign of a potential health hazard. And just because you don’t see microorganisms doesn’t mean they are not present. Bacterial growth is one of the sources of cat smell that can be harmful to your health so it’s important to sanitize your home. Avoid masking cat smell with harmful fragrances. Covering-up cat smells never eliminates the smell, it just makes your nose detect the fragrance instead. The smell will likely return as soon as the fragrance wears out. There are also times when fragrances will react with the cat smell to create even more unpleasant new smells that are worse than the original smell. There is some misunderstanding about the use of charcoal briquettes for cat smell removal. It’s absorbency is very low and effectiveness marginal. What actually works is activated carbon which is used commercially but that can get expensive and is hard to get in small quantities to get rid of cat smells. Best to save the charcoal briquettes for your next BBQ! While some commonly recommended home remedies for smell removal may help marginally with some mild smell problems, they are ineffective for the most part. It’s good to remember that household items such as vinegar, vanilla, and charcoal briquettes are not designed to be smell eliminators so the results will often be disappointing and you could lose precious time. Since you will become immune to smell with time, you may think it’s getting better and risk long term exposure to some chemical smells that can be harmful without knowing. Do not use any ammonia-based cleaning products. Cat urine contains ammonia, and the smell of ammonia will encourage your cat to continue urinating in that location. Avoid using a steam cleaner. The moisture and heat will make the odor worse and will not remove the odor from the carpet. If you are tired of cleaning up smell from your cat’s urine, then you can try training your cat. It will take some time and a lot of effort but once your cat learns where to urinate, then you wouldn’t have to worry about cat urine smell anymore. If you are having trouble locating the cat urine on the floor or furniture, run a black light over the area to find it. Yes, you can use SMELLEZE Pet Smell Deodorizer Pouches and/or SMELLEZE Cat Litter Deodorizer Granules to eliminate smells from cats. They products have been around for over 15 years and work great! I need advice about stopping my cats from marking spots in my house. I have 4 cats and they all have been spayed and neutered. I am desperate. We are not trained to give advice about animals, only odors. If you are having trouble with an odor with your cats then i would recommend using our SMELLEZE™ Reusable Cat Deodorizer Pouches.